Glycine Willd. (1802), nom. cons. Type species: G. clandestina Wendl. Triendilix Raf., New Fl. 1: 85. 1836. Kennedynella Steud., Nom. Bot. ed. 2. 1: 845. 1840. Leptocyamus Benth., Trans. Linn. Soc. London 18: 209. 1839; Glycine sect. Leptocyamus (Benth.) Benth., Fl. Austral. 2: 243. 1864; Glycine subg. Leptocyamus (Benth.) F.J.Herm., Techn. Bull. U.S.D.A. No. 1268 (Rev. Gen. Glycine): 10. 1962 . Leptolobium Benth., Commentat. Legum. Gener. 60. June 1837, nom. illeg. non Vogel (April-May 1837). Hermann, F.J. 1962. 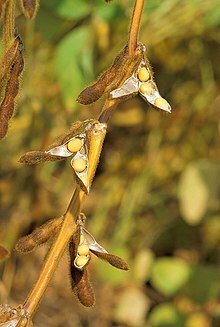 A revision of the genus Glycine and its immediate allies, Technical Bulletin, United States Department of Agriculture. Washington, DC., No 1268. 82 p .
Willdenow, C.L. von 1802. Sp. Pl. ed. 4. 3(2): 1053. For more multimedia, look at Glycine (Fabaceae) on Wikimedia Commons. This page was last edited on 19 February 2019, at 20:32.